This simple house was built by William O'Neill and his brothers John and Michael, on sub-divided property belonging to their father, John O'Neill, at the site of the family's fishing room at Taylor's Point. Construction began in 1907, the year that William and Cecilia O'Neill were married. Their new home was not completed until 1909, and the young couple lived with in-laws for two years. The house was a residence to three generations of the O'Neill family, and artifacts associated with the construction of the house are still in the possession of the O'Neill family. The William and Cecilia O'Neill Property is a rare example of the typical late 19th and early 20th century Irish-Newfoundland family residence in Conche. The O'Neill Property abuts the salt water in a sheltered cove, on fairly level land. The site is bounded roughly by natural features of the landscape: on the north, the lower road of Conche; on the south, a footpath and remnants of a fence; on the east, a brook; and on the west by a hill named Taylor's Point, named after a Taylor from Carbonear who moved onto the Treaty Shore during the Napoleonic Wars, and was ousted by the French when they returned after 1815. The property is associated the history of this part of the French Treaty shore, from occupation by French migratory fishers to the arrival of the Irish settlers. The O'Neill family traces its roots to Henry O'Neill, who was shipwrecked in the Strait of Belle Isle in 1850. Sharing a Irish County Waterford connection with the local Casey family, Henry married their daughter, and received a share of their property. The French had allowed the family to settle there in return for looking after a French fishing room. By 1865, the resident Irish population had greatly increased and the French abandoned Conche harbor in favor of nearby Crouse and North East Crouse. Today, the O'Neill house is one of the only remaining older buildings in Conche which still retains its associated outbuildings, namely a stable and store. A laneway and traditional footpaths are still evident upon the site. The wharf is still used and maintained in the cove, giving a clear picture of the traditional fishing room and the integration of work and family life. The property is a rare example of the typical late 19th, early 20th century Irish-Newfoundland family residence in Conche, a long-standing and major centre of the French migratory fishery. Its heritage value lies in its associated history, the architectural completeness of the property, its typically small scale and unadorned features, its setting and its relationship to the sea. 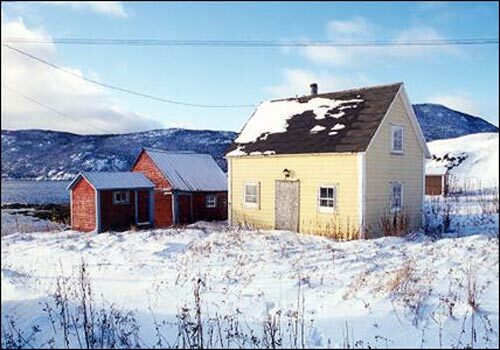 The William and Cecilia O'Neill Property was designated as a Registered Heritage Structure by the Heritage Foundation of Newfoundland and Labrador on March 31, 2001. Also view William and Cecilia O'Neill Property Registered Heritage Structure, and William and Cecilia O'Neill Property Municipal Heritage Site on the Heritage Foundation of Newfoundland and Labrador web site. The Newfoundland and Labrador Heritage Web Site has on its site only a portion of the registered heritage structures in Newfoundland and Labrador. To view a complete list or search for a particular structure visit the Heritage Foundation's Property Search page.